Essentially that it "can't create container" when it starts the process of trying to create what it needs for the tests. Running it from SSH to one of the CSVs. Didn't have a problem at any point on vSphere with 3.x as I haven't done many of these yet, so was just making sure it shouldn't be problem. You aren't doing anything special to run it right? 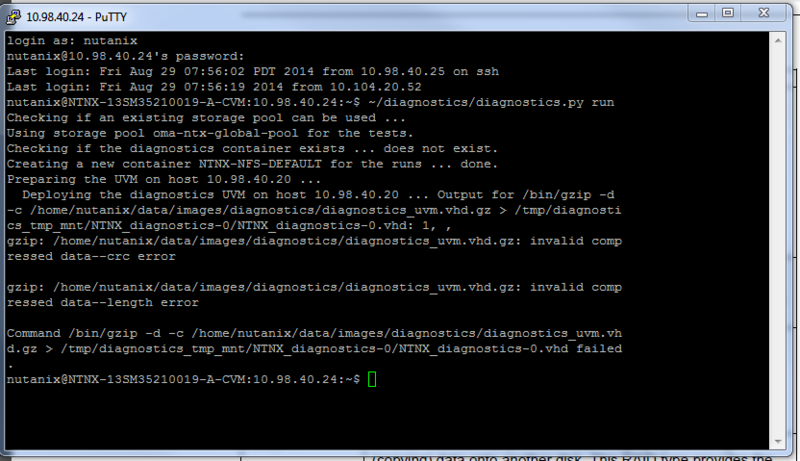 1) What exact errors are you seeing when running the command? 2) Did you run the script in the past without running the cleanup (diagnostics.py cleanup) at the end? Plain text or screen shots should suffice. Im not onsite today, but seeing if i can get customer to run it again for us and send me the exact screenshot for you. stand by.. Interesting, looking at the output there it seems that the diagnostic VM is corrupted, maybe there was an issue with the pheonix ISO. Do you know what Pheonix ISO was used to install this? Did they upgrade to 4.0.1 or fresh install? We can probably just replace the image with a good one and then the tests will complete. The best way to do this would be to open a case so that we can investigate and get him the right file.